The Museum of Modern art in Castilla y Leon is fostering an ambitious project baptised with the name, The iris of Lucy in honour of Lucy, the ancestor of our species, the homo sapiens. But the exhibition restores what was stolen: Lucy was rebaptised by the Afar people, an autochthonous community, with the name Dinkesh which means: “You are amazing”. The co-curator of the exhibition Orlando Brito, a true passionate and fierce defender of African art, intends to make a statement through the title in order to demonstrate the West’s ethnocentric perspective and its inability to wholly comprehend otherness. Lucy’s bones and skull where discovered in Ethiopia and the co-curator Orlando Brito wonders why we do not name the skeleton after an Ethiopian princess or warrior? Furthermore, the criteria upon which the 21 artists were selected was based on the materials they work with and their social commitment. “Contemporary” materials may refer to original formats and mediums like video, photography or even “academic” genres revisited. As for the social commitment, the exhibition privileges artists desiring to improve their artistic practice and their social surroundings. Therefore, the museum becomes a more labyrinthic space where history is revisited and where the spectator can flow amid the political and aesthetics. The iris of Lucy is a parable of African history, a parable portraying centuries of struggle seen through the prism of multiple irises. The project gathers the work of 21 female artists to give them the opportunity to relate their own version of historical and social events. For instance, the Algerian artist Amina Zoubir chose to display Figure Oubliée, a sculpture representing “Kahena”’s face, a postcolonial figure considered to be one of the first feminists. Moreover, in an unstigmatized way, it approaches controversial issues such as HIV, gender, postcolonialism, religion, sexuality, violence, politics and what Brito calls “the emotional realm”, empowering women and giving them visibility. Wangechi Mutu’s collage I belong to you, You belong to me examines the female body and deforms it in order to liberate woman’s figure from a standardised appearance. Equality is the condition of progress according to Brito and women, as a whole, are still struggling to attain the same rights as men. Even though the exhibition focuses on female African artists, every woman and every human being can empathize with what is exhibited. South African artist, Tracey Rose exhibits The Kiss, a black and white photograph of a kissing couple. The title of the image evokes the Auguste Rodin’s masterpiece with the same name. White supremacy over the art world is denounced via this photograph. Another example of the reigning universalism and the exploring of the human condition within The iris of Lucy, is the series by the English émigré Sue Williamson, From the Inside, a photographical journey portraying the struggle of HIV/AIDS patients. Williamson aims to empower them and to convert their shame into acceptance if not indifference. In contemporary art versatility is a condition and it has the striking capacity to flow between tradition and modernity, it has the ability and the liberty to navigate over time and space. There are multiple “levels” and readings within the project contributing to an enormously rich exhibition. However, The iris of Lucy intends to highlight the particularities uniqueness of African culture and to further the idea of universalism. Despite the exhibition’s title and the conception behind it, it deploys human vulnerability in the 21th century. Although the project takes its place in a context where African artists are being legitimized in the contemporary art scene and the art market, the exhibition is the result of Brito’s interest in Africa. He has always been captivated by the continent’s cultural vitality. After Magiciens de la Terre in the Centre Georges Pompidou in 1989, an exhibition that gathered artists and craftsmen from all over the world – including Africans – there was an enormous absence of African artists in the art world. 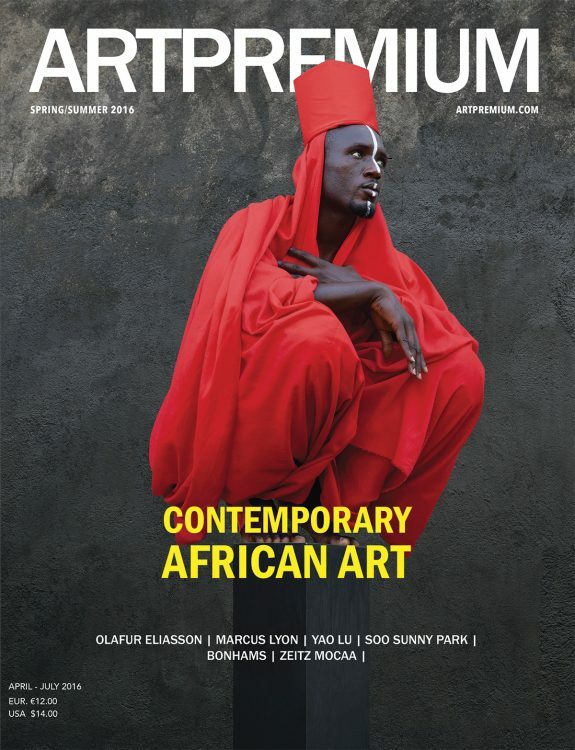 Now, due to a number of factors, for instance the reach of the internet, African artists are sharing a momentum of valorisation, not to be compared with the popularity or legitimacy of the West’s contemporary artists, but representing some progress.